This article is about aluminium(III) oxide, Al2O3. For other uses, see Aluminium oxide (compounds). Aluminium oxide (IUPAC name) or aluminum oxide (American English) is a chemical compound of aluminium and oxygen with the chemical formula Al2O3. It is the most commonly occurring of several aluminium oxides, and specifically identified as aluminium(III) oxide. It is commonly called alumina and may also be called aloxide, aloxite, or alundum depending on particular forms or applications. It occurs naturally in its crystalline polymorphic phase α-Al2O3 as the mineral corundum, varieties of which form the precious gemstones ruby and sapphire. Al2O3 is significant in its use to produce aluminium metal, as an abrasive owing to its hardness, and as a refractory material owing to its high melting point. Corundum is the most common naturally occurring crystalline form of aluminium oxide. Rubies and sapphires are gem-quality forms of corundum, which owe their characteristic colors to trace impurities. Rubies are given their characteristic deep red color and their laser qualities by traces of chromium. 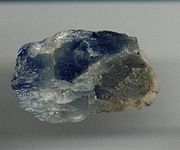 Sapphires come in different colors given by various other impurities, such as iron and titanium. Al2O3 is an electrical insulator but has a relatively high thermal conductivity (30 Wm−1K−1) for a ceramic material. Aluminium oxide is insoluble in water. In its most commonly occurring crystalline form, called corundum or α-aluminium oxide, its hardness makes it suitable for use as an abrasive and as a component in cutting tools. Aluminium oxide is responsible for the resistance of metallic aluminium to weathering. Metallic aluminium is very reactive with atmospheric oxygen, and a thin passivation layer of aluminium oxide (4 nm thickness) forms on any exposed aluminium surface. This layer protects the metal from further oxidation. The thickness and properties of this oxide layer can be enhanced using a process called anodising. A number of alloys, such as aluminium bronzes, exploit this property by including a proportion of aluminium in the alloy to enhance corrosion resistance. The aluminium oxide generated by anodising is typically amorphous, but discharge assisted oxidation processes such as plasma electrolytic oxidation result in a significant proportion of crystalline aluminium oxide in the coating, enhancing its hardness. Aluminium oxide was taken off the United States Environmental Protection Agency's chemicals lists in 1988. Aluminium oxide is on the EPA's Toxics Release Inventory list if it is a fibrous form. The most common form of crystalline aluminium oxide is known as corundum, which is the thermodynamically stable form. The oxygen ions form a nearly hexagonal close-packed structure with the aluminium ions filling two-thirds of the octahedral interstices. Each Al3+ center is octahedral. In terms of its crystallography, corundum adopts a trigonal Bravais lattice with a space group of R3c (number 167 in the International Tables). The primitive cell contains two formula units of aluminium oxide. Aluminium oxide also exists in other, metastable, phases, including the cubic γ and η phases, the monoclinic θ phase, the hexagonal χ phase, the orthorhombic κ phase and the δ phase that can be tetragonal or orthorhombic. Each has a unique crystal structure and properties. Cubic γ-Al2O3 has important technical applications. The so-called β-Al2O3 proved to be NaAl11O17. Molten aluminium oxide near the melting temperature is roughly 2/3 tetrahedral (i.e. 2/3 of the Al are surrounded by 4 oxygen neighbors), and 1/3 5-coordinated, with very little (<5%) octahedral Al-O present. Around 80% of the oxygen atoms are shared among three or more Al-O polyhedra, and the majority of inter-polyhedral connections are corner-sharing, with the remaining 10–20% being edge-sharing. The breakdown of octahedra upon melting is accompanied by a relatively large volume increase (~20%), the density of the liquid close to its melting point is 2.93 g/cm3. The structure of molten alumina is temperature dependent and the fraction of 5- and 6-fold aluminium increases during cooling (and supercooling), at the expense of tetrahedral AlO4 units, approaching the local structural arrangements found in amorphous alumina. The product aluminium oxide tends to be multi-phase, i.e., consisting of several phases of aluminium oxide rather than solely corundum. The production process can therefore be optimized to produce a tailored product. The type of phases present affects, for example, the solubility and pore structure of the aluminium oxide product which, in turn, affects the cost of aluminium production and pollution control. Known as alundum (in fused form) or aloxite in the mining, ceramic, and materials science communities, aluminium oxide finds wide use. Annual world production of aluminium oxide in 2015 was approximately 115 million tonnes, over 90% of which is used in the manufacture of aluminium metal. The major uses of speciality aluminium oxides are in refractories, ceramics, polishing and abrasive applications. Large tonnages of aluminium hydroxide, from which alumina is derived, are used in the manufacture of zeolites, coating titania pigments, and as a fire retardant/smoke suppressant. Over 90% of the aluminium oxide, normally termed Smelter Grade Alumina (SGA), produced is consumed for the production of aluminium, usually by the Hall–Héroult process. The remainder, normally called speciality alumina is used in a wide variety of applications which reflect its inertness, temperature resistance and electrical resistance. Being fairly chemically inert and white, aluminium oxide is a favored filler for plastics. Aluminium oxide is a common ingredient in sunscreen and is sometimes also present in cosmetics such as blush, lipstick, and nail polish. Many formulations of glass have aluminium oxide as an ingredient. Aluminium oxide catalyses a variety of reactions that are useful industrially. In its largest scale application, aluminium oxide is the catalyst in the Claus process for converting hydrogen sulfide waste gases into elemental sulfur in refineries. It is also useful for dehydration of alcohols to alkenes. Aluminium oxide serves as a catalyst support for many industrial catalysts, such as those used in hydrodesulfurization and some Ziegler–Natta polymerizations. Aluminium oxide is widely used to remove water from gas streams. Aluminium oxide is used for its hardness and strength. It is widely used as an abrasive, including as a much less expensive substitute for industrial diamond. Many types of sandpaper use aluminium oxide crystals. In addition, its low heat retention and low specific heat make it widely used in grinding operations, particularly cutoff tools. As the powdery abrasive mineral aloxite, it is a major component, along with silica, of the cue tip "chalk" used in billiards. Aluminium oxide powder is used in some CD/DVD polishing and scratch-repair kits. Its polishing qualities are also behind its use in toothpaste. It is also used in microdermabrasion, both in the machine process available through dermatologists and estheticians, and as a manual dermal abrasive used according to manufacturer directions. Aluminium oxide flakes are used in paint for reflective decorative effects, such as in the automotive or cosmetic industries. Aluminium oxide has been used in a few experimental and commercial fiber materials for high-performance applications (e.g., Fiber FP, Nextel 610, Nextel 720). Alumina nanofibers in particular have become a research field of interest. Some body armors utilize alumina ceramic plates, usually in combination with aramid or UHMWPE backing to achieve effectiveness against even most rifle threats. Alumina ceramic armor is readily available to most civilians in jurisdictions where it is legal, but is not considered military grade. Alumina is used to manufacture tiles which are attached inside pulverized fuel lines and flue gas ducting on coal fired power stations to protect high wear areas. They are not suitable for areas with high impact forces as these tiles are brittle and susceptible to breakage. The Al2O3 films prepared using O3 show 10–100 times lower leakage current density compared with those prepared by H2O. Aluminum oxide, being a dielectric with relatively large band gap, is used as an insulating barrier in capacitors. Health and medical applications include it as a material in hip replacements and birth control pills. It is used as a dosimeter for radiation protection and therapy applications for its optically stimulated luminescence properties. Most ceramic eyes on fishing rods are circular rings made from aluminium oxide. ^ a b Material Properties Data: Alumina (Aluminum Oxide) Archived 2010-04-01 at the Wayback Machine. Makeitfrom.com. Retrieved on 2013-04-17. ^ Patnaik, P. (2002). Handbook of Inorganic Chemicals. McGraw-Hill. ISBN 978-0-07-049439-8. ^ Raymond C. Rowe; Paul J. Sheskey; Marian E. Quinn (2009). "Adipic acid". Handbook of Pharmaceutical Excipients. Pharmaceutical Press. pp. 11–12. ISBN 978-0-85369-792-3. ^ a b Zumdahl, Steven S. (2009). Chemical Principles 6th Ed. Houghton Mifflin Company. ISBN 978-0-618-94690-7. ^ a b NIOSH Pocket Guide to Chemical Hazards. "#0021". National Institute for Occupational Safety and Health (NIOSH). ^ a b c d e "Alumina (Aluminium Oxide) – The Different Types of Commercially Available Grades". The A to Z of Materials. 3 May 2002. Archived from the original on 10 October 2007. Retrieved 27 October 2007. ^ Elam, J. W. (October 2010). Atomic Layer Deposition Applications 6. The Electrochemical Society. ISBN 9781566778213. ^ Campbell, Timothy; Kalia, Rajiv; Nakano, Aiichiro; Vashishta, Priya; Ogata, Shuji; Rodgers, Stephen (1999). "Dynamics of Oxidation of Aluminium Nanoclusters using Variable Charge Molecular-Dynamics Simulations on Parallel Computers" (PDF). Physical Review Letters. 82 (24): 4866. Bibcode:1999PhRvL..82.4866C. doi:10.1103/PhysRevLett.82.4866. Archived (PDF) from the original on 2010-07-01. ^ "EPCRA Section 313 Chemical List For Reporting Year 2006" (PDF). US EPA. Archived from the original (PDF) on 2008-05-22. Retrieved 2008-09-30. ^ a b I. Levin; D. Brandon (1998). "Metastable Alumina Polymorphs: Crystal Structures and Transition Sequences". Journal of the American Ceramic Society. 81 (8): 1995–2012. doi:10.1111/j.1151-2916.1998.tb02581.x. ^ a b c Paglia, G. (2004). "Determination of the Structure of γ-Alumina using Empirical and First Principles Calculations Combined with Supporting Experiments" (free download). Curtin University of Technology, Perth. Retrieved 2009-05-05. ^ Wiberg, E.; Holleman, A. F. (2001). Inorganic Chemistry. Elsevier. ISBN 978-0-12-352651-9. ^ a b Skinner, L.B. ; et al. (2013). "Joint diffraction and modeling approach to the structure of liquid alumina". Phys. Rev. B. 87 (2): 024201. Bibcode:2013PhRvB..87b4201S. doi:10.1103/PhysRevB.87.024201. Archived from the original on 2013-02-24. ^ Paradis, P.-F.; et al. (2004). "Non-Contact Thermophysical Property Measurements of Liquid and Undercooled Alumina". Jpn. J. Appl. Phys. 43 (4): 1496–1500. Bibcode:2004JaJAP..43.1496P. doi:10.1143/JJAP.43.1496. ^ Shi, C; Alderman, O L G; Berman, D; Du, J; Neuefeind, J; Tamalonis, A; Weber, R; You, J; Benmore, C J (2019). "The structure of amorphous and deeply supercooled liquid alumina". Frontiers in Materials. 6 (38). doi:10.3389/fmats.2019.00038. ^ "Bauxite and Alumina Statistics and Information". USGS. Archived from the original on 6 May 2009. Retrieved 2009-05-05. ^ "Aloxite". ChemIndustry.com database. Archived from the original on 25 June 2007. Retrieved 24 February 2007. ^ Evans, K. A. (1993). "Properties and uses of aluminium oxides and aluminium hydroxides". In Downs, A. J. (ed.). The Chemistry of Aluminium, Indium and Gallium. Blackie Academic. ISBN 978-0751401035. ^ Akers, Michael J. (2016-04-19). Sterile Drug Products: Formulation, Packaging, Manufacturing and Quality. CRC Press. ISBN 9781420020564. ^ Hudson, L. Keith; Misra, Chanakya; Perrotta, Anthony J.; Wefers, Karl and Williams, F. S. (2002) "Aluminum Oxide" in Ullmann's Encyclopedia of Industrial Chemistry, Wiley-VCH, Weinheim. doi:10.1002/14356007.a01_557. ^ Mallick, P.K. (2008). Fiber-reinforced composites materials, manufacturing, and design (3rd ed., [expanded and rev. ed.] ed.). Boca Raton, FL: CRC Press. pp. Ch.2.1.7. ISBN 978-0-8493-4205-9. ^ "Ballistic Resistance of Body Armor" (PDF). US Department of Justice. NIJ. Retrieved 31 August 2018. ^ Osborn, Joseph H. (2014). "understanding and specifying anodizing: what a manufacturer needs to know". OMW Corporation. Archived from the original on 2016-11-20. Retrieved 2018-06-02. ^ Li, Q; Liang, J; Wang, Q. "Modern Surface Engineering Treatments, chapter 4 Plasma Oxidation Coatings on Lightweight Metals" (PDF). INTECH 2013. Archived (PDF) from the original on 2016-03-04. ^ Higashi GS, Fleming (1989). "Sequential surface chemical reaction limited growth of high quality Al2O3 dielectrics". Appl. Phys. Lett. 55 (19): 1963–65. Bibcode:1989ApPhL..55.1963H. doi:10.1063/1.102337. ^ Kim JB; Kwon DR; Chakrabarti K; Lee Chongmu; Oh KY; Lee JH (2002). "Improvement in Al2O3 dielectric behavior by using ozone as an oxidant for the atomic layer deposition technique". J. Appl. Phys. 92 (11): 6739–42. Bibcode:2002JAP....92.6739K. doi:10.1063/1.1515951. ^ Kim, Jaebum; Chakrabarti, Kuntal; Lee, Jinho; Oh, Ki-Young; Lee, Chongmu (2003). "Effects of ozone as an oxygen source on the properties of the Al2O3 thin films prepared by atomic layer deposition". Mater Chem Phys. 78 (3): 733–38. doi:10.1016/S0254-0584(02)00375-9. ^ Belkin, A.; Bezryadin, A.; Hendren, L.; Hubler, A. (20 April 2017). "Recovery of Alumina Nanocapacitors after High Voltage Breakdown". Scientific Reports. 7 (1). doi:10.1038/s41598-017-01007-9. ^ "GE Innovation Timeline 1957–1970". Archived from the original on 16 February 2009. Retrieved 2009-01-12. ^ "DailyMed - JUNEL FE 1/20- norethindrone acetate and ethinyl estradiol, and ferrous fumarate". dailymed.nlm.nih.gov. Archived from the original on 2017-03-13. Retrieved 2017-03-13. ^ Farndon, John (2001). Aluminum. Marshall Cavendish. ISBN 9780761409472. Archived from the original on 2017-12-04. Wikimedia Commons has media related to Aluminium oxide.